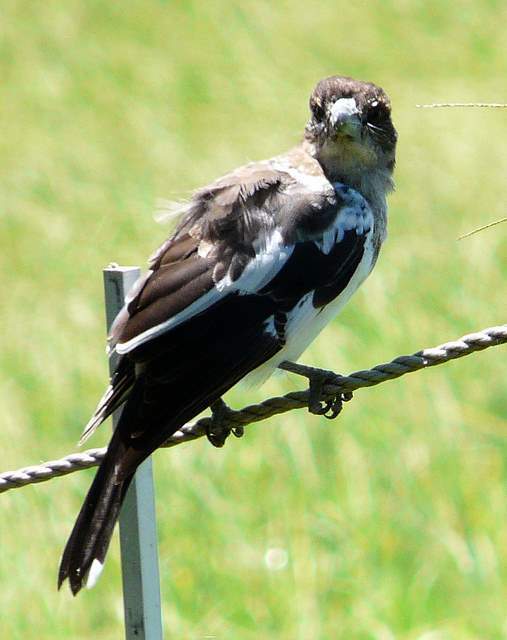 The young Butcherbird came calling today while I was hanging out the washing. He sat on the pole just a few feet from my head and squeeched at me a few times. It was the young one I’ve seen the parents train over the last couple months, but they were nowhere in sight. Looks like he’s out on his own now and he knows he won’t be harmed here and may even find food. I greeted him in my usual manner ‘Hello there little one’ and he squeeched at me again, he hasn’t quite found his voice yet. I went inside to get some grain bread, which is what I feed the birds around here when they are hungry. I’m sure he’d prefer some grasshopper but I don’t keep a supply, just a few photo’s of them. And he can’t eat them. Digital nourishment, did you ever hear of such a thing? Not likely. There were a couple of slices in the fridge so I took them and broke them up for distributing on the grass by the washing line. Other birds eat the bread too, it supplements their diet in a largely agricultural or swamp area and lets them know there is somewhere they are welcome. They remember the simple good. And it is a pleasure to have the birds around. I just went out the back to see if I could get a photo of the young one but he was already gone. There was something else though. I noticed a large bee or wasp flying in from the field and under the table. It was a deliberate flight path, as if she knew where she was going. So I had a look. Under the tabletop, at the top of one of the legs was a large wasp or hornet’s nest. These were fierce looking creatures, not to be disturbed lightly. It had begun getting dark so I had only a few minutes to get a photo but I didn’t want to get too close. So I shot with flash from about six feet away with full zoom. There were a lot of wasps and they were big and aggressive looking. But they didn’t see me as a threat, even though it is a very active and productive hive. You can see where some of the chambers of the nest obviously have some live young. I think I can also make out one or two wasps laying, but I can’t be sure. I knew someone who once disturbed a nest like this one by accident and she was badly stung. One or two stings can be treated with a cold pack, but many more stings require some medicine if any is available. 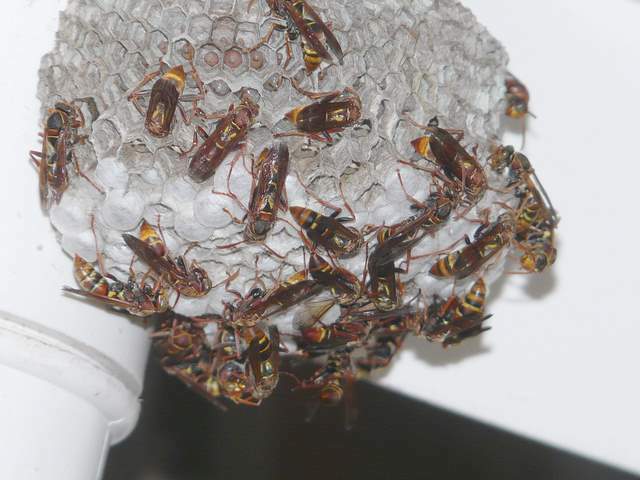 They can use their stingers many times if they feel threatened. These creatures can be very dangerous but it’s only me here so I think I’ll leave them alone to breed. They are no harm to me that I know, as long as I leave them alone. I just have to remember they are there. Whenever I observe nature I am always reminded of human nature and how people everywhere represent to me the various characteristics of natural behaviour. The difference is humans get emotional and hold on to the particular behaviour long after it has served its purpose. And even display these characteristics out of context, which is insane. We don’t forget as readily as the natural creatures which is how we built the world of comfort and convenience, by building on what we remembered from last time. But we also built a world of terrible potential in the atom bomb and chemical and biological weaponry. Given our propensity for emotional behaviour I’d say it’s only a matter of time before we loose our stingers on the Earth for no more reason than it seemed right at the time. Maybe a young Butcherbird will come along and eat all the wasps, but I don’t think so. It’s a very productive and well defended nest.